Halloween is not for the timid, or for those who want boring drinks. Whether you’re hosting an adults-only party, or chaperoning a kid-fest, you need a cocktail to go with that costume! Van Gogh Vodka has an arsenal of delicious, spooky Halloween drinks that make for tasty treats, no tricks needed. This cocktail recipe is courtesy of Van Gogh Vodka. Combine Van Gogh Classic 80 Proof Vodka and Banana Liqueur into a mixer with ice. Shake and pour into the bottom of the shot glass. 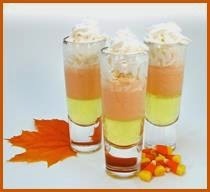 Then combine Coconut Rum, Orange Curacao, Cream and a dash of Grenadine (for color). Shake in shaker with ice and gently layer on top using a spoon. Top with whipped cream.